Ellis Cycles: Dave's (that's me) Show bike! 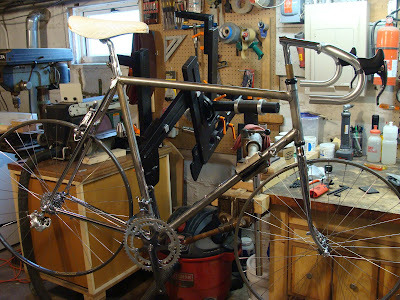 And then the bike is brazed and finished! Sure I missed a couple steps, but who wants to see a frame all covered in flux. Once you've seen one, you've seen them all! 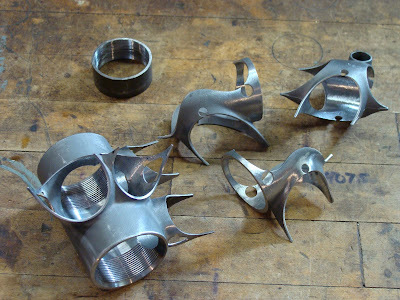 The chain stays and seat stays are polished 953, so I've left the dropout points proud of the stays. 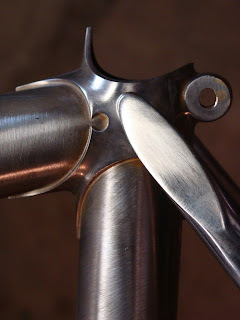 Polished seat stays meet painted seat lug. Going to be some careful masking for Jason. Fast forward to 2009. I'm working at Ben's Cycle in Milwaukee while Ellis Cycles gets going and Ben's does a ton of business with Euro Asia imports. 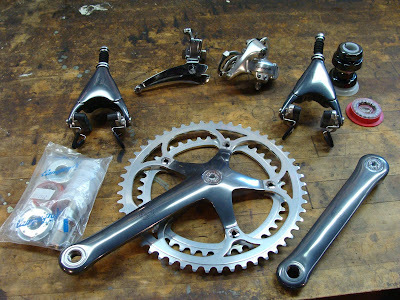 We just so happen to have a full Campy Record kit with Delta brakes. Don't even get me started on these brakes, I know they don't have the best reputation for function, they're heavy, but DAMN do they look cool! Form over function in this case. OK, so after getting the Record kit back fr0m some nutty customer, the folks in Ben's web sales were ready to send the whole shebang back to Euro Asia. I decided it time to build my 1991 dream bike, so I plunked down a bunch of my hard earned cash! Campy parts, I've got the hubs built into wheels with an Ambrosio Synthesis Durex in the back and Crono Durex in the front. More NOS parts from Ben's! 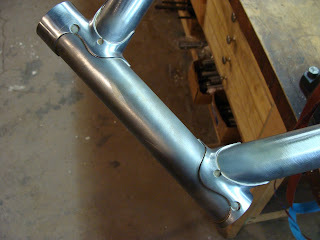 Also a classic non anatomic set of Nitto handlebars. I got it back from the polisher, cleaned it off and then I just had to hang some parts on it! Sat in the basement for about 10 minutes just looking at it before Lisa got home and I made her look at it too! I love her for humoring me! Thanks also go to Jason P. for the almost mint Turbo Special saddle. Once the bike's done I'll get that stem, (also custom made), down a little lower. Talked to Jason about paint and we're thinking of white with just the head tube logo and down tube logo in a gunmetal gray/blue to match the "Century" finish on the parts. 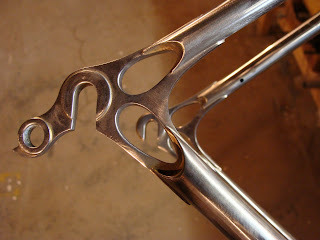 The seat stays and chain stays will be fully polished and the fork is chromed. I can't wait to get it built up! Maybe you can go home again? I can't wait to see that painted and built up! I am a big fan of the minimalist classic paint scheme. Hey gobucky, your frame is almost ready too! Jason's working faster than I thought!